We hope you all had a joyous Christmas weekend. We had a wonderful holiday with our new little pea and my family. We hosted Christmas dinner last night and it was one big party. We had five kids under the age of five at the table, there was never a dull moment:) My family will be in town all week. I am glad the fun doesn’t have to end just yet. 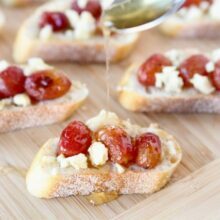 If you are still entertaining or gearing up for a New Years party and need an easy appetizer, try this Roasted Grape, Blue Cheese, & Honey Crostini. 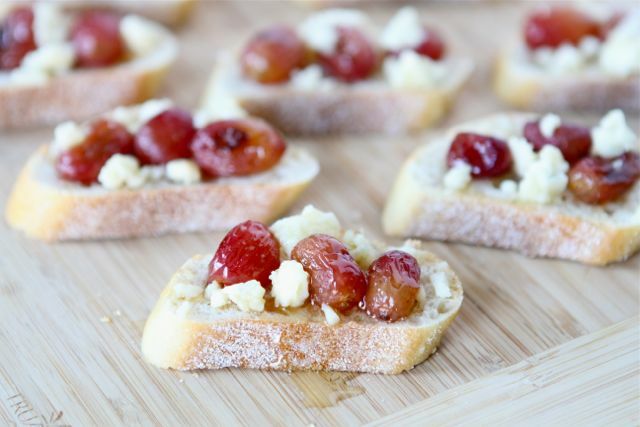 This crostini recipe is super easy, which makes it perfect for parities and entertaining. 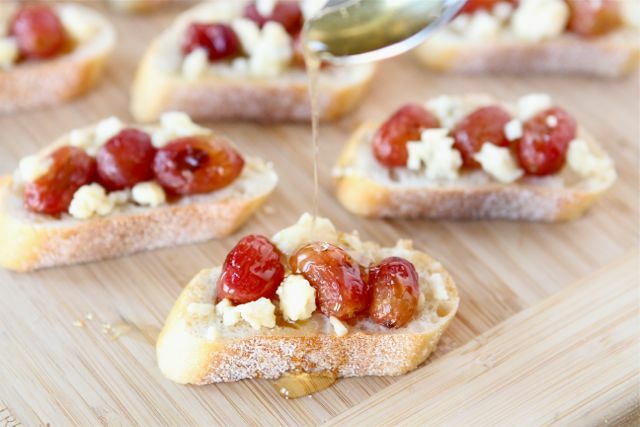 You only need five ingredients-olive oil, grapes, French baguette, blue cheese, and honey. Roasting the grapes doesn’t take long and it brings out a nice sweet flavor. 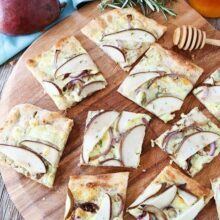 The savory, salty cheese goes really well with the sweet grapes and honey. This stunning appetizer is sure to be a hit at any party. Preheat oven to 400 degrees F. Place grapes on a large baking sheet. Drizzle grapes with olive oil and gently toss. Roast for 20-25 minutes or until grapes are soft and slightly shriveled. Let the grapes cool to room temperature. Place 3 grapes on top of a baguette slice. 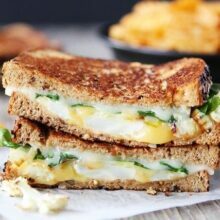 Top with blue cheese and a drizzle of honey. Serve. 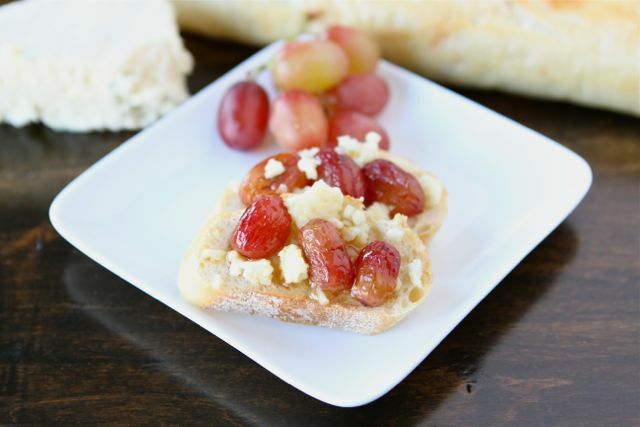 You’re the second blog in the last couple days that I’ve seen roasted grapes on, and before that, another bloggie friend of mine makes them with brie. I NEED to try this because they look so good. Oh girl, these look gorgeous. 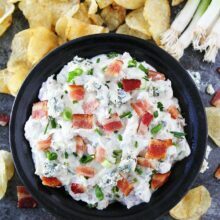 I make a similar crostini with brie but think it’s time to switch things up and try it with blue cheese! These look really good! I would love them with blue cheese, but I would probably try them with brie as well, as someone else suggested, as blue cheese is a little too strong for my husband. Brie would work as well! omg these look fantastic! Hope you had a great holiday and happy new year!! I might have to just eat these for lunch this week! No party necessary. The sweet tangy combination sounds irresistible! I updated the recipe to include toasting instructions:) Enjoy! I don’t think I’ve ever had this flavor combination before, but it sounds amazing! What is it about blue cheese that marries so well with honey? I think a blue cheese/honey salad dressing would work well too. And, yum on the roasted grapes. My God! Love those plump juice grapes…. Sounds delish! This totally just blew my mind. I cannot imagine how those flavors would taste together… but I am dying to find out! Fantastic recipe girl! Looks totally delicious and so elegant, I love it! Great idea. Roasted grapes make a big appearance when I’m entertaining too: http://bit.ly/pNt0N0 Happy Holidays! I just tried roasted grapes with brussels sprouts this year and loved the deep sweetness the grapes added. I can only imagine how good these little crostini must be! Happy New Year! Love the sweet savory combo & the roasted grapes! I love any fruit / blue cheese combo and this looks especially delicious! Merry Christmas! Roasted grape and blue cheese a great combination. What a great idea to use grapes! I would have never thought of that. Love it! 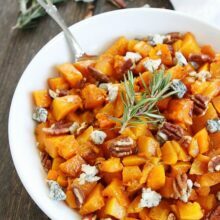 Do you think this would work with goat cheese instead of blue? Looks like the perfect little bites, love all those flavors. Have you tried melting the bleu cheese onto the bread and then putting the grapes on top of the melted cheese? It seems the the cheese and grapes would fall off easily and I am all about preventing messes :). I made something similar, with blue cheese, raspberries, and actual honeycomb on a crostini! So good. never thought to use grapes but oh my, these look delicious!! These beautiful little appetizers almost make me wish I were throwing a New Years’ Eve party tonight, just so I could make them! The thought of roasting grapes has honestly never crossed my mind but I really can imagine them being such a winning combination with the blue cheese and a little honey! I absolutely must try roasting grapes! 🙂 Why I did not think of that before? I just featured this post as Article of The Week, just a thumb and link to your site, hope you don’t mind. Looks perfect for an Academy Award viewing party I am going to. The added cheese and honey takes to really over the top. We need to bring apps and this looks like just the ticket. Pun totally intended. I have made a roasted grape chicken before and never in my wildest dreams did I think roasted grapes could have so much depth of flavor! Nah, they look like tomatoes. . . It was pretty funny. And I can’t wait to try it! These look amazing! MUST make them. Your photos are always gorgeous, too.